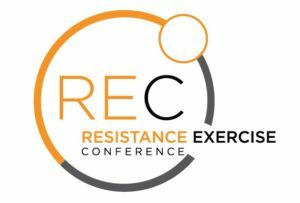 I attended the Resistance Exercise Conference (REC) in Minneapolis March 22-23, 2019. 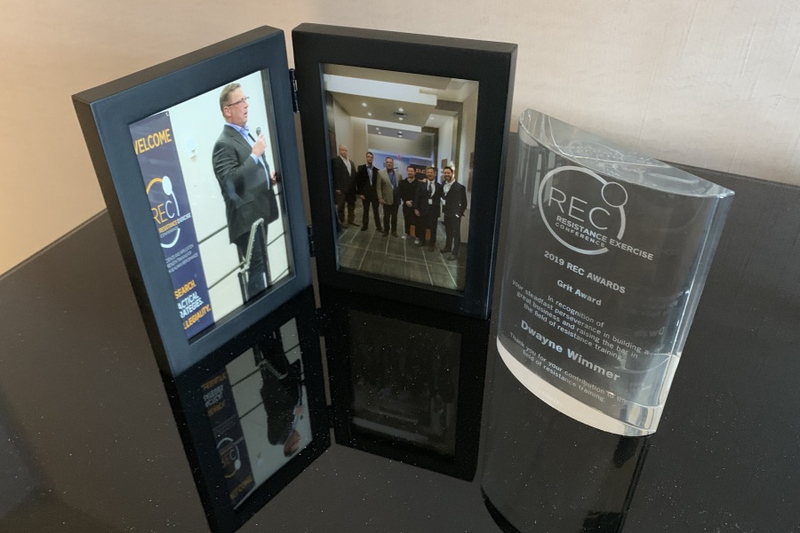 I was thrilled and honored to receive the REC award for Grit “In recognition of your steadfast perseverance in building a great business and resining the bar in the field of resistance training”. The whole conference was a great experience full of inspiration and information sharing among the best that the field has to offer. We kicked off the conference with a bus tour of five different personal training studios in the Minneapolis area, learning and sharing tips with other professionals to see their studio setups. We visited Dexafit in Bloomington, the Discover Strength facilities in Downtown Minneapolis and Plymouth, Fitness First in Excelsior, and the My Strength Studio in Minnetonka. The Keynote speakers this year brought in some legends of the industry to share their insights. Dr. Jeremy Leonneke, is an Assistant Professor of Health, Exercise Science and Recreation Management for the University of Mississippi. His presentation was “Only The Strong Survive: Fact or Fiction”. Dr. Doug McGuff, a High Intensity Training and Fitness Medicine expert, presented on “Stimulus-Organism-Response 20 Years Later: Things That I Believe and Things That Research Supports”. Luke Carlson, the founder and CEO of Discover Strength, gave a fascinating talk on “The Goose and the Golden Egg”. Dr. James Fisher, the Course Leader for the School of Sport, Health and Social Sciences at Solent University, spoke on “Evolutionary Thinking: Changing your mind-set for rationalizing resistance training variables.” We also heard a Special Topic presentation about “Lessons Learned from 8 Years as a NFL Strength Coach” from Chaz Mahle, Assistant Strength and Conditioning Coach for the Minnesota Vikings. New to the Resistance Exercise Conference agenda this year were the RAPID talks, which gave presenters only 4 minutes to share their best idea with the audience. My presentation was “Planning, Persistence & Procrastination, 3P’s to Success”. Success looks differently for every person–you must begin by defining your own success, rather than a nebulous concept of “success” or success as it is defined for you by others expectations for you. Once you have an honest conversation with yourself about the success that you are reaching for, you need to master the art of proactive planning, unconditional persistence, and creative procrastination. Failing to plan in planning to fail. If you are in business or planning your week with you kids schedules you are making a plan. We have to be efficient a mindful of what we are planning and make sure it alines with what we define a success. Persistence is, in my opinion the most important quality to have to be successful. The quote from Dr. Martin Luther King, Jr said it best in his quote. “If you can’t fly, then run, if you can’t run then walk if you can’t walk then crawl, but whatever you do you have to keep moving forward.” So, it doesn’t matter how fast you are moving, keep moving toward your definition of success. So, define your success, plan for it, be persistent in achieving it and procrastinate on the little things that will get in the way of being successful. The “Unconference”, where the crowd chose topics that they wanted to discuss the next day which would be tackled by the Keynote speakers leading breakout sessions on Saturday. The Unconference tackled a wide range of both business and fitness topics, including marketing, blood flow restriction, overcoming plateaus with routine design, MedX Lumbar Extension, overtraining and frequency, and myokines. The crowd-sourced breakout sessions were followed by a Keynote Roundtable panel discussion, where the Keynotes speakers took questions from the crowd to discuss anything they wanted to know more about. That evening we all enjoyed the Saturday Night Closing Party, where they held their was music, dancing, desert and the inaugural REC Awards. There were three awards presented that evening. I was honored with The Grit Award – In recognition of your steadfast perseverance in building a great business and resining the bar in the field of resistance training. 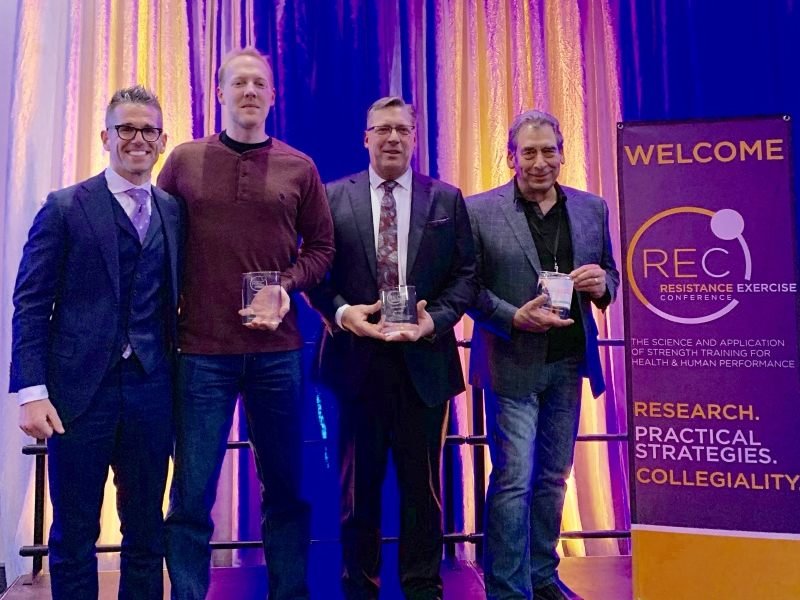 Michael Petrella was awarded The Envy Award – In recognition of building a facility and collection of equipment that inspires strength training practitioners around the world. Bill Crawford was awarded The Arthur Jones, Lifetime Achievement Award – In recognition of lifetime achievement, contribution, and advancement in the field of resistance training. If you’d like to invite Dwayne Wimmer to speak or present at your fitness industry event, please get in touch.